It was inevitable. The various tycoons of the video gaming business needed a new foot hold. They had done all kinds of games; FPS, TPS, Fighter, Side-scroller, Puzzle, Sports--but one type of game was missing. Then, in 1998, THPS hit the Playstation. It was an instant hit. Published by Activision and developed by Neversoft, the game combined everything that most teens (and some adults) enjoy: rebellion, music, and insane stunts. Furthermore, the interactivity of the environments made the game ultimately replayable. Since then, the extreme sports gaming industry has spawned many titles, including Jonny Mosely Mad Trix, Shaun Palmer\'s Pro Snowboarder, Kelly Slater\'s Pro Surfer, and Dave Mirra\'s Freestyle BMX. The game focuses on pedaling to get around. If you don\'t pedal, you won\'t do any tricks. Combine that with realistic physics, and you get the gist of Dave Mirra. 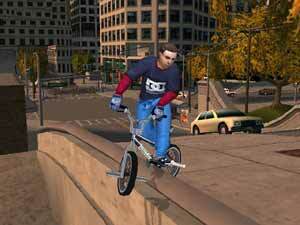 The game\'s tricks are unlockable, like in the first THPS, except that with a BMX bike you get more daring stunts. The environments are even more interactive than any of the other extreme sports titles. You need to speak to other bikers to get your mission objectives, and if you manage to find gaps in the map (gaps are huge jumps), you get respect points, which eventually earn you sponsors, and a souped-up bike. Unlike in the THPS games, you don\'t earn stats. You get them by getting new bikes. This makes a truly revolutionary system along the lines of Dark Summit, except without the plot. The graphics have jaggies at times, and the graphics are also muddy at times. I would recommend this game to most everyone. From a Christian perspective, this game does have language. They bleep it out for the most part, but it still is offensive. They also have music by Black Sabbath in it, as well as Godsmack. These two choices offend me, but, what can I do? The game play is good, and you can always turn off the music.